We all love to show off our trendy and flashy nail art, but when it comes to taking it off it’s a whole different story. Not many women pay attention to the type of polish remover they buy. If you have discovered rough, whitish color on your nails after using the nail polish remover then you should immediately stop applying it. This guide will tell you which product is the right choice for your nails by reviewing the best products on the market to give a breeze to your shopping experience. 0.1 What type of nail polish remover you should buy ? What type of nail polish remover you should buy ? If you are shopping for a nail polish remover then always look for the ones that are acetone free. Removers with acetone can be very harsh on your nails and will damage the quality of your nails. Look for ingredients like Aloe Vera or lanolin. They moisturize your nails and don’t make them brittle. Certain brands offer removers in bottles while some brands provide pre-soaked sponge applicators. It is entirely your choice. You may try both as trials and then decide which suits you better. No matter what type of nail polish remover you are using, always moisturize your nails after using the remover. Packaging: Peach color, classy look bottle of 1.7 ounces. 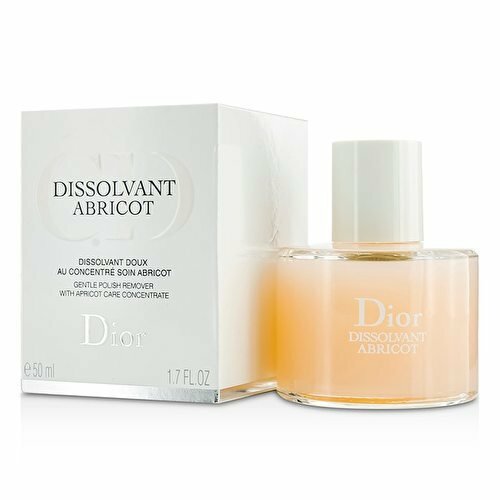 Formula: The Dior nail polish remover is not only acetone-free, but it also has the ingredients to moisturize and hydrate your nails. Performance and reviews: Works gently and efficiently on your nails, leaving them clean and shiny. Contains extracts that moisturize and nourish your nails and the effect is visible from the first time you use it. The best way to apply it is with a cotton pad and massage gently. It’s best for the fragile or brittle nail; if you had bad experiences with other nail products, this one would be a delight. The only downside is that it is a bit pricey. Packaging: The 4-ounce bottle assures you that you’ll have enough for a long while. The cap has a built-in dropper. Formula: It is free from petroleum chemical, acetate, and ethyl lactate. As it is cruelty-free, chemical free and non-toxic, is safe for the kids too and pregnancy-safe. Given the formula and the quantity this makes a good choice for mothers or soon-to-be moms. Pure Vitality Beauty claims that all the ingredients used are rated 0 and 1 in the cosmetic safety reviews. Performance and reviews: If you use nail polish that doesn’t have glitter in it then go for this product. It is not only budget-friendly, but the powerful formula removes even the stubborn UV gel nail polish. The plant extracts provide the nourishment you need for your fingernails and toenails, strengthening and moisturizing them. Packaging: A cute eight fluid ounce bottle reveals the purple color nail polish remover. Formula: Contains natural ingredients and is a 3 in 1 formula: polish remover, nail prep, and nail conditioner. Performance and reviews: The odor is not overwhelming. Your nails will become stronger as you start using it. Also, it doesn’t dry out your nails. It’s efficient even in small amounts and can be applied using rounded cotton pads. The moisturizing and conditioning effect prepares the nails for the next coat, leaving them impeccable. Packaging: A large bottle of 4 Fl. oz. (118 ml), the nail polish remover is colorless. Formula: This is 3-in-1 soy-based nail polish remover that has argan oil and 100% natural ingredients. It has vitamin A, C, and E that promotes nail growth and conditions your cuticles. It is gluten-free, cruelty-free and vegan. Performance and reviews: If no other nail product satisfies you then probably this will. The natural ingredients are effective and are not at all harsh on your nails. For glitter nails, you need to take a cotton pad soaked in the nail polish remover. Cover your glitter nails in the cotton pad and keep it for a minute. You may then easily remove the glitter from your nails. Packaging: 7 oz. (207ml). It’s a jar that contains a soft sponge soaked in the removal formula. Formula: It is not entirely natural. It has protein enriched acetone in it. 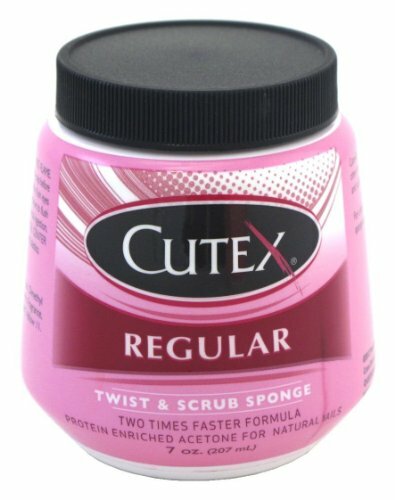 Performance and reviews: Cutex Twist and Scrub is very fun to use! All you have to do is just stick each finger in the sponge and twist the jar. It’s super comfortable, clean and relaxing, and the best thing is how fast everything goes. It’s not abrasive, and it does remove even the toughest spots of nail polish. On natural and acrylic nails it’s very efficient, for gel nails, however, you have to give some time for each nail to soak in the sponge. The jar contains an extra smaller sponge you can use to soak in the can and then get it out and work on your toenails as well. Remember to wash your hands with warm water and soap before and after you use this product. The liquid remover in the sponge may dry out if you don’t close the cap tightly. Packaging: Looks like a bottle of face wash! Yes, it is that big, 16oz of pure force. Formula: This product has 100% pure acetone, and you should use it only if you have resistant nails. Performance and reviews: If you are looking for a good cheap nail polish remover, you can trust Onyx Professional. It’s very efficient on artificial nails, nail polish, gel polish and glitter. It contains acetone which might make your nails whitish in color. I will recommend this product only to the ones having great nails. Also, this product is efficient and removes glittery with ease. Do not use this product regularly as it will dry out your nails. Always moisturize your nails after using it. Packaging: A 4 Fl. oz. (120ml) bottle; the cap has a built-in dropper. Formula: This product is completely natural and doesn’t contain acetone or any other toxic substance. The herbal blend works as a treatment; it revitalizes the nail bed and cuticles. The product is environmentally friendly, and all the ingredients are rated 0 or 1 in the Cosmetic Safety Review by the Environmental Work Group’s Skin Deep. Performance and reviews: You can use the dropper, few drops on each nail and let it soak for 3 minutes or so and then rub it with a cotton ball. Because it doesn’t contain acetone, it won’t evaporate, so it’s also moisturizing the nails and the cuticles. This way, dry and damaged nails will be naturally strengthened and hydrated making it the right product for dry nails. The formula is very effective; it removes quickly even the most persistent polishes. It doesn’t have any scent at all, and because it’s free of harmful chemicals, it won’t bother even the most sensitive skin. Packaging: It looks like a small version of a spatula. 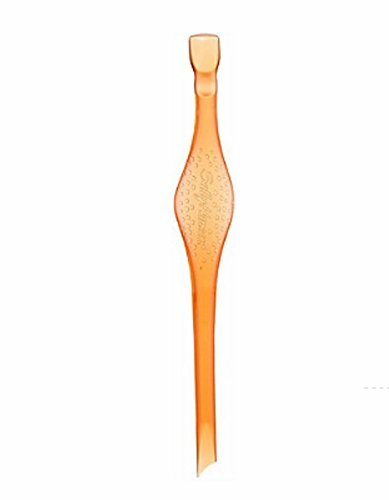 It’s a tool used to remove gel nail polish and does the work of manicure as well. Performance and reviews: This is a 3-in-one gel remover tool that removes gel nail polish, pushes the cuticles back and cleans your nails. Since most of the nail polish cannot remove gel or glitter nail polish, this tool becomes handy. Also, if you prefer doing the manicure at home, then this tool can do most of the job. Packaging: 200 pieces of disposable nail wraps with cotton pads. Performance and reviews: These nail wraps remove the harsh gel polish in no time. They’re perfectly sized to use on fingernails and toenails. You just need to apply the remover liquid on the pad and use the aluminum foil wrap on your nails and for 15 minutes then wrap it off. Packaging: The mint green color is enticing! The curvy bottle has 6 oz. Formula: It has natural ingredients enriched with botanical oils to moisturize and hydrate your nails. It does contain some amount of acetone. Performance and reviews: If you are looking for something affordable and of best quality then this product is a must try. 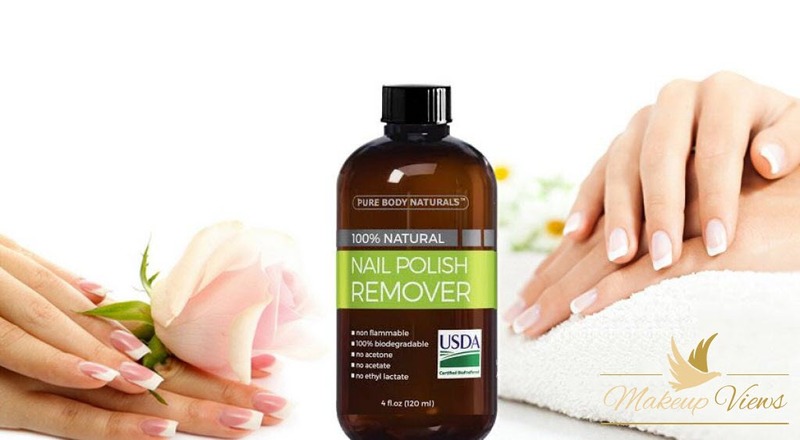 The nail polish remover has a mild smell and performs its job flawlessly. Do not get frightened if it has acetone. The botanical oils hydrate and nourish your nails. It removes gel nail polish as well. The oil present in it doesn’t allow you to apply nail polish for some time. Packaging: Pen shaped, red and white. Formula: Has acetone along with glycerin to condition your nails. Performance and reviews: It’s very useful for nail art to remove misapplied colors or to use on spots with stubborn polish. The tip of the pen is designed to access the toughest places to remove the polish excess on your cuticles. Packaging: These are four frosted glasses with non-clog pumps. Performance and reviews: It comes in a package of 4 and is a little pricey, but the quality is good. It is sturdy and is a great tool to dispense liquid. The glass is thick and prevents fluid from dripping. It prevents clogging by acrylic residual from the nail polish. Packaging: Bottle of 4 Fl. oz. Performance and reviews: This product is ideally suited for mothers or soon-to-be moms. 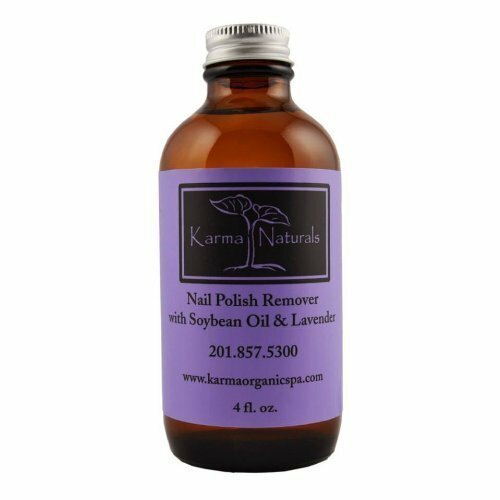 It’s the best organic nail polish remover that doesn’t contain any chemicals. 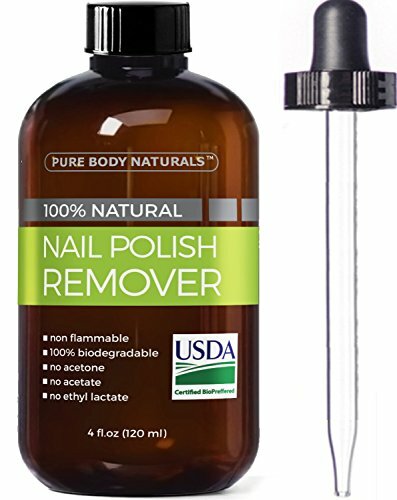 This remover effectively removes all types of nail polish, even glitter. You may require more amount of remover to eliminate the harsh nail polish, but it certainly does its job. Packaging: Bottle of 3.7 Fl. oz. (480 ml). Formula: This is an acetone-free product. Contains Aloe Vera to hydrate and nourish nails and cuticles. Performance and reviews: Works very fast and efficient even on glitter polishes. 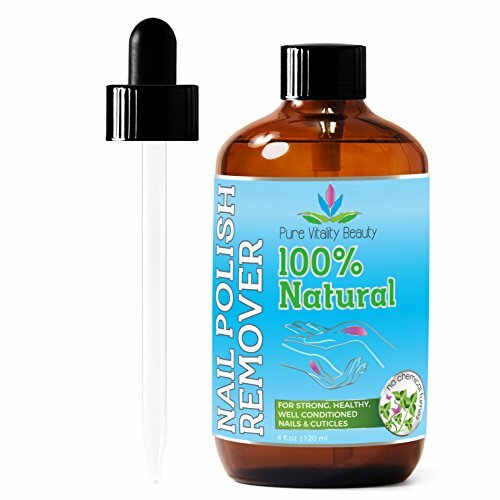 If you are looking for an acetone-free nail polish remover then you may give this a try. Also, it has a strong odor. Copyright © 2018 www.dressedupnails.com | All rights reserved.